Using the impulse responses of these multipath channels, the bit error rate (BER) performance for binary pulse amplitude modulation impulse radio ultra-wideband communication system is calculated. The optimization location of receiving antenna is investigated by dynamic differential evolution (DDE) and genetic algorithm (GA) to minimize the outage probability. Numerical results show that the performance for reducing BER and outage probability by DDE algorithm is better than that by GA.
Ultra-wideband (UWB) transmissions can legally operate in the range from 3.1 up to 10.6 GHz at a limited transmit power of -41 dBm/MHz . All wireless systems must be able to deal with the challenges of operating over a multipath propagation channel, where the object in the environment can cause multiple reflections. Bit error rate (BER) degradation is caused by the inter-symbol interference due to a multipath propagation made up of radio wave reflections by walls, ceilings, floors, and office fixtures. In general, effective antenna selection and deployment strategies are important for reducing BER in indoor wireless systems [2, 3]. To the best of our knowledge, there is still no investigation using the dynamic differential evolution (DDE) and genetic algorithm (GA) to optimize the location of receiving antennas for minimizing the BER in indoor wireless communication channel. Based on the BER formula, the outage probability is chosen as the cost function in our optimization procedure. Thus, the optimization of location of receiving antenna in this paper is using DDE and GA to overcome the above situation and to minimize the outage probability. The remainder of this paper is organized as follows: In Section 2, channel modeling, system description, dynamic differential evolution, and genetic algorithm procedure are presented. The numerical results are then presented in Section 3, and conclusion is made in Section 4. Frequency responses for sinusoidal waves by shooting and bouncing ray (SBR)/image [4–23] techniques. The SBR/image method can deal with high-frequency radio wave propagations in the complex indoor environments [24, 25]. Inverse fast Fourier transform (IFFT) and Hermitian processing. The frequency responses are transformed to the time domain using the inverse Fourier transform with the Hermitian signal processing . Using the Hermitian processing, the pass-band signal is obtained with zero padding from the lowest frequency down to direct current (DC), taking the conjugate of the signal and reflecting it to the negative frequencies. The result is then transformed to the time domain using IFFT . Since the signal spectrum is symmetric around DC. The resulting doubled-side spectrum corresponds to a real signal in the time domain. where N is the number of paths observed at time, δ(·) is the Dirac delta function, and a n and τ n are the channel gain and time delay for the n-th path, respectively. where x(t) is the transmitted signal, h(t) is the impulse response of the equivalent baseband, and n(t) is the white Gaussian noise with zero mean and variance N0/2. Block diagram of the simulated communication system. where Et is the average transmitted energy. Z n = ∫ n - 1 T d n T d ∑ n = 1 ∞ p t - n - 1 T d d n ⊗ h t · q t dt + ∫ n - 1 T d n T d n t q t dt = V n + η ( n ) . where P d ⇀ is the occurring probability of the binary sequence d ⇀ . where i = 1 ~ D and χ is the scaling factor associated with the vector difference X m k - X n k . Note that ζ is set to 0 for DE; therefore, the main differences between DDE and DE is that DDE includes the idea of approaching the 'best’ during the course of optimization procedure. The flowchart of the dynamic differential evolution. X j k + 1 = u j k + 1 , if CF ( u j k ) < CF ( X j k ) X j k , otherwise . 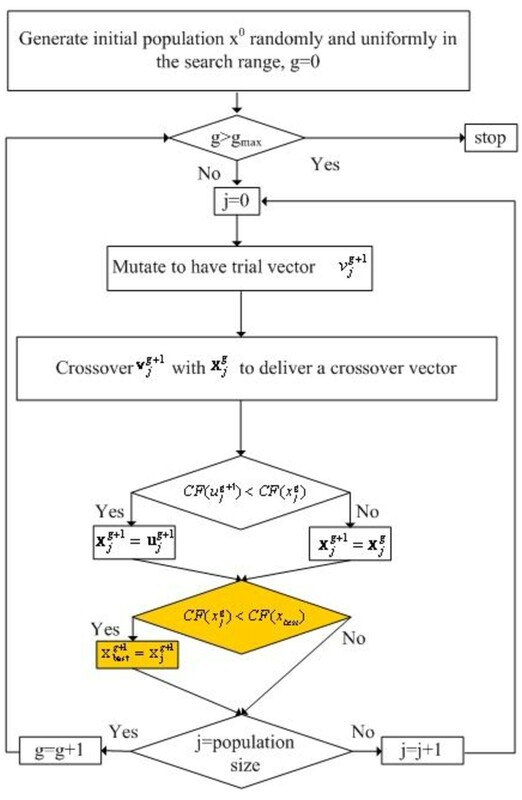 Selection operation is conducted by comparing the parent vector X j k + 1 with the crossover vector u j k + 1 . The vector with smaller cost function (CF) value is selected as a member for the next generation. where cost function is the outage probability for UWB system. The outage probabilities for 100-Mbps B-PAM and for a BER < 10-3 versus SNR are calculated. DDE is used to search the receiver antenna location to minimize the outage probability of the communication system. This SBR/image method technique is used to calculate the UWB channel impulse response for each location of the receiver. Based on the channel impulse response, the number of multipath components, the root mean square (RMS) delay spread τRMS, and the mean excess delay τMED are computed. The DDE algorithm iteratively generates a new population that springs from the previous population through the application of the reproduction by mutation and replacement operators. In our simulation, when the cost function is bigger than the threshold value or DDE does not find a better individual within 300 successive generations, the DDE will be terminated, and a solution is then obtained. Genetic algorithm (GA) is the global numerical optimization methods based on genetic recombination and evaluation in nature [32, 33]. They use the iterative optimization procedures, which start with a randomly selected population of potential solutions and then gradually evolve toward a better solution through the application of the genetic operators. GA typically operates on a discretized and coded representation of the parameters rather than on the parameters themselves. These representations are often considered to be 'chromosomes’ , while the individual element, which constitutes chromosomes, is the 'gene’ . Simple but often very effective chromosome representations for optimization problem involving several continuous parameters can be obtained through the juxtaposition of discretized binary representations of the individual parameter. We regulate the receiver antenna location of the indoor environment to minimize the outage probability. The GA starts with a population containing a total of GP candidates (i.e., GP is the population size). Each candidate is described by a chromosome. Then, the initial population can simply be created by taking GP random chromosomes. GA iteratively generates a new population, which is derived from the previous population through the application of the reproduction, crossover, and mutation operators. The GA is used to minimize the cost function in Equation 15, where cost function is the outage probability for UWB system. Through repeated applications of reproduction, crossover, and mutation operators, the initial population is transformed into a new population in an iterative manner. New populations will contain increasingly better chromosomes and will eventually converge to an optimal population that consists of the optimal chromosomes. As for the GA calculations, each chromosome is assigned information of the position of transmitter as the optimization variables. For each generated chromosome, the GA reruns the ray tracing program to calculate the BER for each receiver from the given location of transmitter provided by the chromosome. In our simulation, when the BER is lower than the threshold value or GA does not find a better individual within 300 successive generations, the GA will be terminated and a solution is then obtained. A ray tracing technique is developed to calculate the channel impulse response from 3.1 to 10.6 GHz with frequency interval of 5 MHz, i.e., 1,501 frequency components are used. Since the dielectric constant and conductivity of the materials change with frequency, the different values of dielectric constant and conductivity of materials for different frequencies are carefully considered in channel calculation [34–37]. The BER for different receiver positions in the indoor environments are investigated. Figure 3 is the top view of the indoor environment with dimensions of 10 m (length) × 9.2 m (width) × 3 m (height). The transmitting and receiving antennas are with simple omnidirectional radiation pattern and vertically polarized. Each antenna is with a fixed height of 1 m. The optimal antenna location for minimizing the outage probability is searched by DDE and GA. The relative coefficients of the DDE are set as follows: The scaling factors of F and λ are both 0.8, and the crossover rate CR = 0.6. The population size Np = 30. The relative coefficients of the GA are set as follows: The crossover rate Gr = 0.6. The mutation probability GM= 0.025, and the population size GP = 30. The cases with different transceiver positions are considered in our simulation. 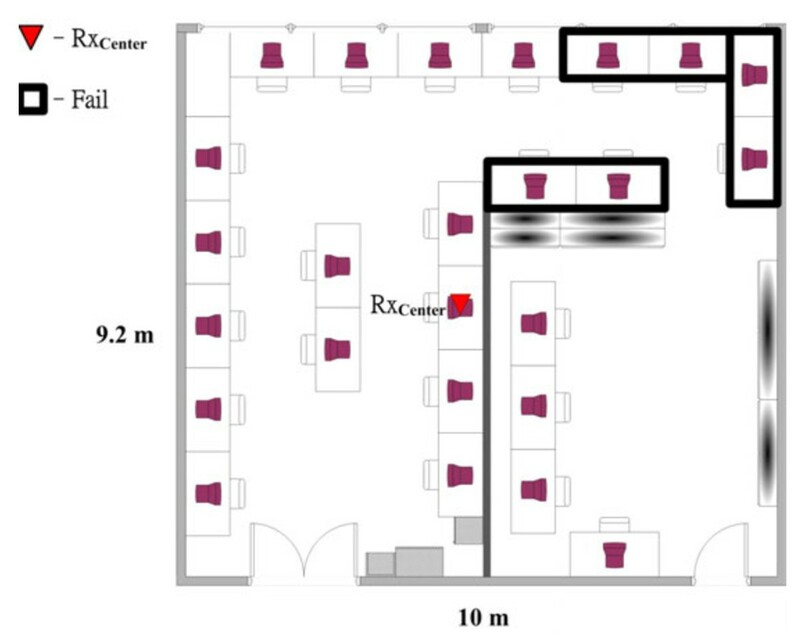 The receiving antenna RxCenter (5 m × 4.6 m × 0.73 m) located in the center of the indoor environment with a fixed height of 1 m is used for our reference, as shown in Figure 3. A plan view of the simulated environment. where G = ∑ n = 1 N a n 2 is the total multipath gain. τ MED = ∑ n = 1 N τ n a n 2 G .
By Equations 16 and 17, we can obtain the RMS delay spreads and mean excess delay. We compare the effects of RxCenter, RxDDE, and RxGA on UWB transmission. 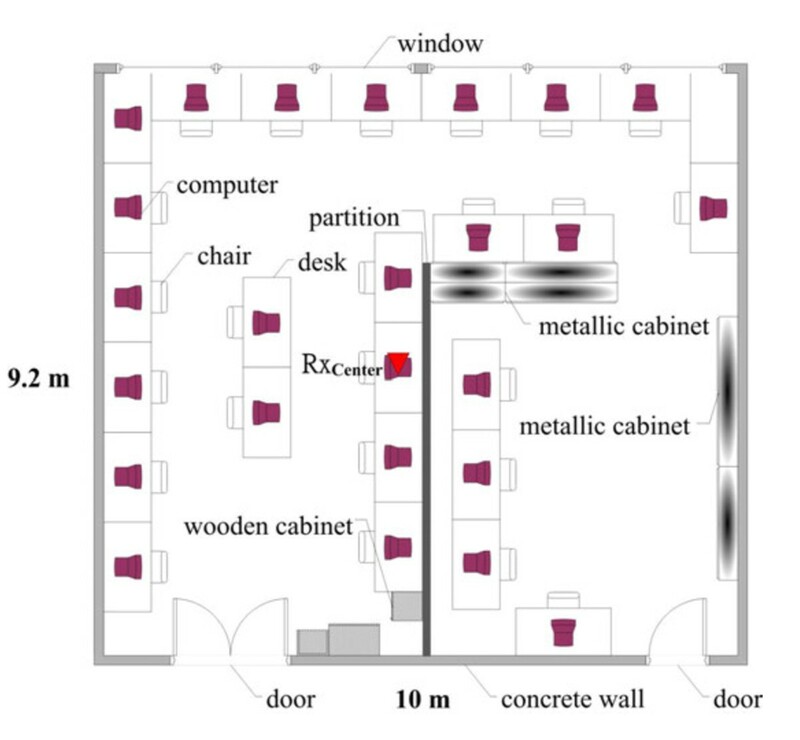 For the case, the receiver is mobile in the whole indoor environment and the transceivers are located on the desk, in which 25 measurements are carried out (e.g., transmission from a computer 'Tx’ to a printer 'Rx’). Figure 4 shows that the transmitting antenna RxCenter (5 m × 4.6 m × 0.73 m) is located in the center of the indoor environment. In this case, six bad receiving signal points (BER > 10-3) occurred including (not highlighted in the figure) the transmitter points. The DDE and GA optimization position of the receiver is shown in Figure 5. 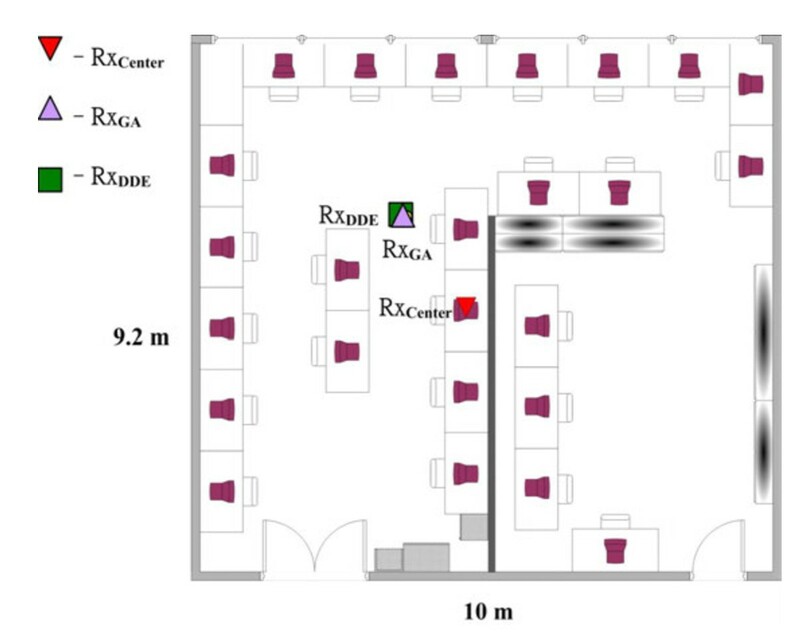 The optimal locations of the receiving antennas are at RxDDE (3.52 m × 6.25 m × 0.73 m) and RxGA (3.56 m × 6.24 m × 0.73 m) using the DDE and GA, respectively. The optimization receiver points RxDDE and RxGA are chosen as the receiver locations as squares/triangle, and no bad transmitting signal point exists. The outage probability versus SNR is calculated, as shown in Figure 6. Here, SNR is defined as the ratio of the average transmitted power to the noise power at the front end of the receiver. It is seen that the outage probability at SNR = 28 dB are about 68%, 8%, and 12% for RxCenter, RxDDE, and RxGA, respectively. It is clear that the outage probability decreased by DDE is better than those by GA about 50%. The performance for the antenna location by DDE is better than that by GA. Outage areas (BER > 10 -3 ) with the use of one transmitter. Optimized receiver position when only one receiver is used. (▼) Receiver position RxCenter is located in the center of the indoor environment. (▲) GA optimized receiver position RxGA. (■) DDE optimized receiver position RxDDE. Outage probability versus SNR for the two kinds of algorithms. 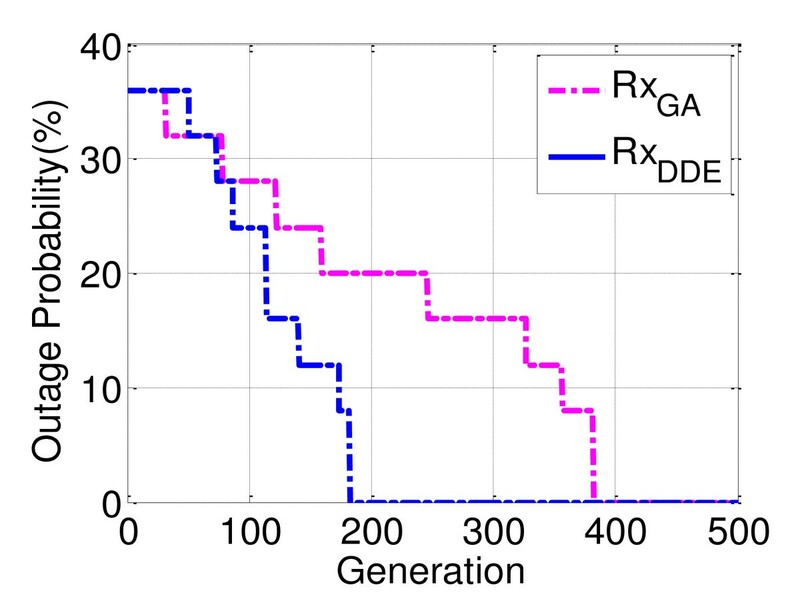 The outage probability versus generation DDE and GA are calculated, as shown in Figure 7. It is found that the outage probability decreases quickly by the DDE, and good convergences are achieved within 182 generations. 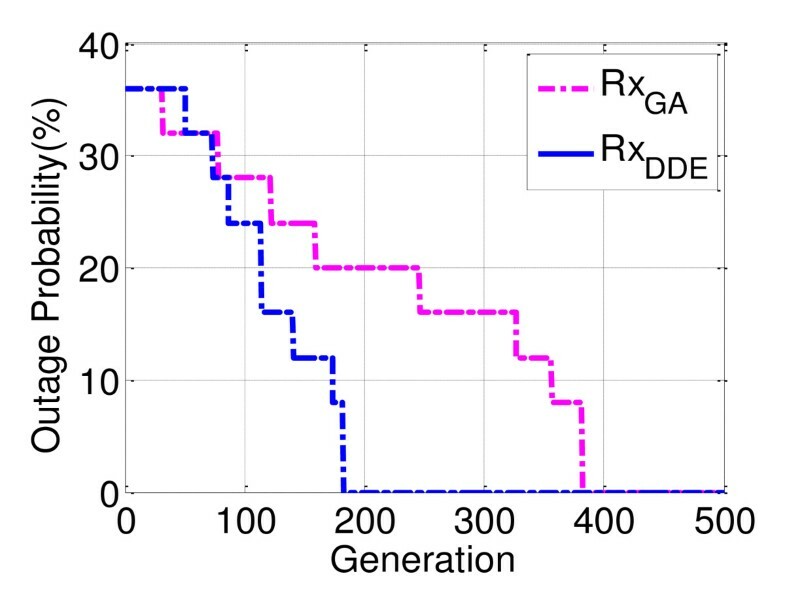 It also shows that the convergent speed for the DDE is faster than that for GA.
Average outage probability versus generations by two different algorithms. In order to determine the multipath effect, the τRMS and τMED were calculated. A summary of these values are given in Table 1 for scenarios. 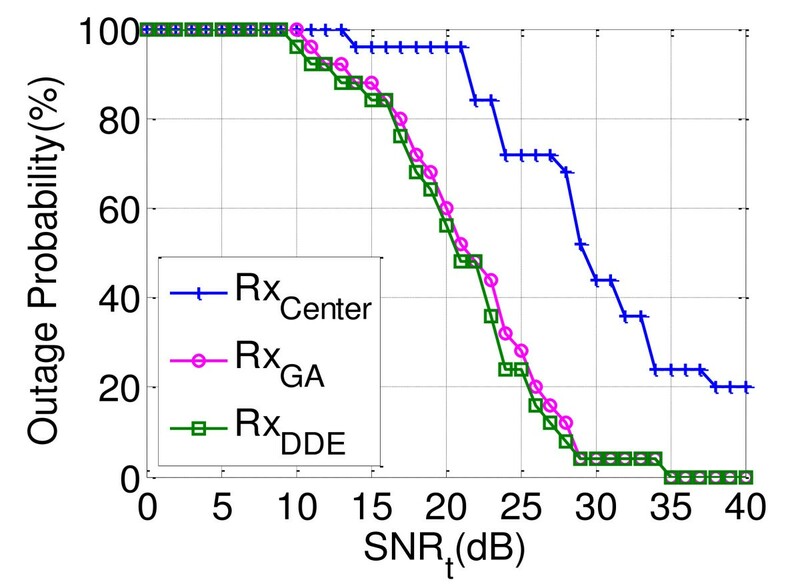 For the transceivers located on the table's case scenario, the τRMS for RxCenter, RxDDE, and RxGA are 12.5, 2.80, and 2.86 ns, respectively. It is clear that the τRMS for the RxCenter case is the biggest. Using the impulse responses of these multipath channels, the BER performance for UWB communication system is calculated. The DDE and GA are used to minimize the BER. Numerical results show that BER in the cases can be decreased. It is also found that the BER decreased by DDE is better than that by GA. Numerical results also show that the DDE outperforms the GA in convergence speed.